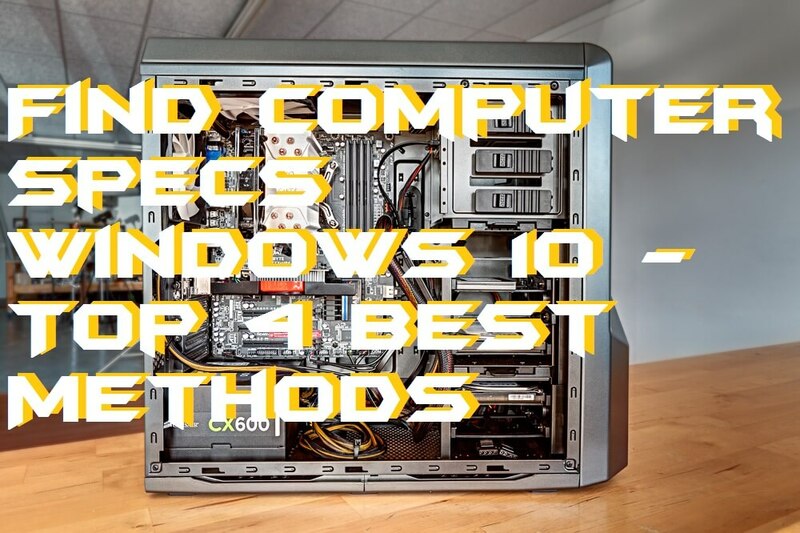 Hello friends, Today I will tell you a method on how to find computer specs Windows 10. Users can find all the specifications of their computer like RAM, Graphics Card, Motherboard and almost all kind of internal and external hardwares. You can check computer specification using these 4 methods. You can use an inbuilt method or check online. All these methods are free and easy to use. I will suggest you try this method once and check complete specifications of your Windows PC/Laptop. 0.1 What are Computer Specs? 0.2 Is it possible to check Computer Specs Windows 10? Computer specification is defined as the detailed configuration of a computer. Users can find the comprehensive comparison of computer specs using these methods. You can identify all kind of computer hardware and software using these methods. These methods can be used to get detailed clarification of your internal and external computer details. Is it possible to check Computer Specs Windows 10? Yes! Checking computer specs in Windows 10 is possible. Nowadays, many of us are using Windows 10 PC/Laptops. Sometimes it happens that we want to know our Windows PC specs. But, the problem occurs is that we don’t know that how to find computer specs Windows 10. There are no minimum requirements to check the specs of your Windows 10 PC. Also, checking the specs of a Windows PC is standard for all Windows OS. Thus, you can use the same method for Windows 10 and any other Windows operating system PC/Laptop. Users can determine specifications like OS name, version, manufacturer, BIOS details, and more. In this method, we will be using two different ways to do so. 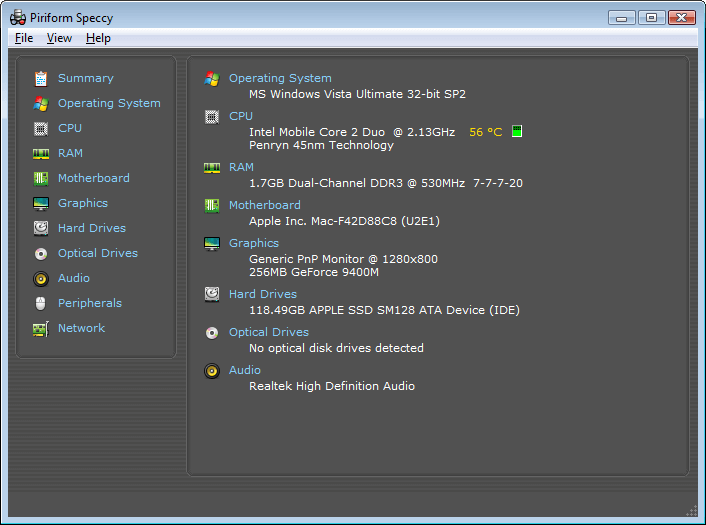 First is by using System Information application and second is by using DirectX application. Though, they will tell us that what are the specs of the targetted Windows PC. However, if you are using Windows 10 PC and don’t know that how to find computer specs Windows 10. Then, don’t worry because this guide is helpful for Windows 10 PC users too. Moreover, the System Information application can be directly run by typing its name in the search box only in Windows 10 OS. But, let us assume that this can’t be done and do it using RUN command. So, let’s check how to find computer specs Windows 10 from these most straightforward methods. 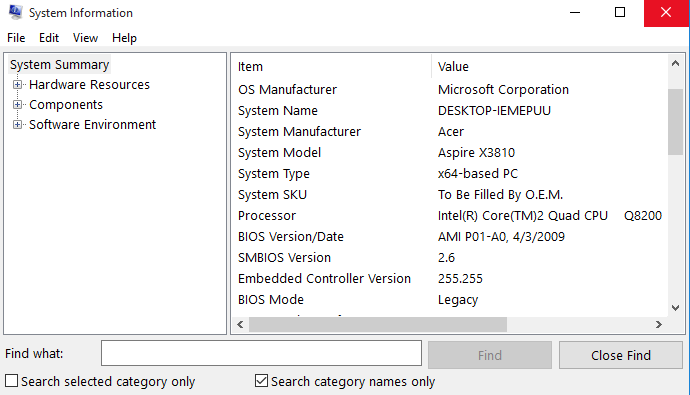 This method will tell you that how to find computer specs Windows 10 as well as other Windows OS using the system information application. This System Information app is a pre-installed app on all Windows OS. So, a Windows user can easily use it to find out the specs of his/her Windows PC. In Windows 10 PC, the system info app can be accessed directly but, in rest of the Windows PC, we have to use RUN command. Let’s assume that Windows 10 cant access it directly and use RUN command. Open RUN by pressing Windows + R key. Then, you will see that all the details of your Windows 10 PC have been opened in front of you. In this method, we are going to use the DirectX application. The DirectX app comes pre-installed on some Windows PC. But, in some, it has to be installed manually to use your Windows PC more smoothly. However, if your Windows 10 PC does not have DirectX app then you can install it manually it’s free. 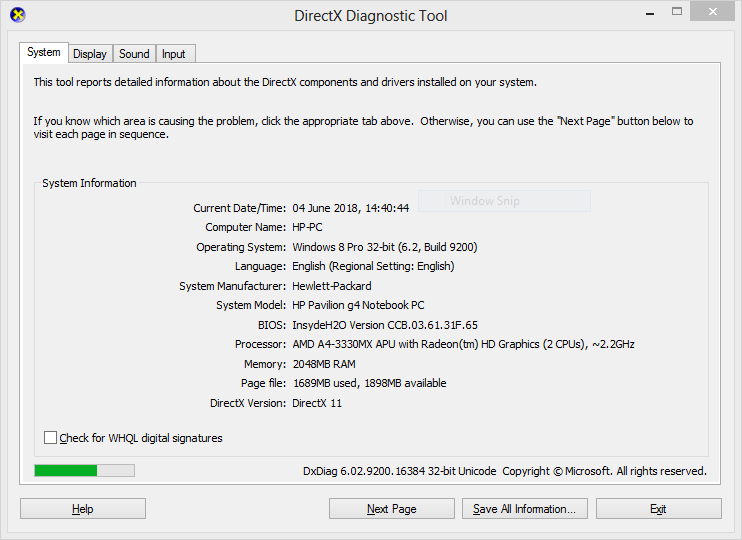 But, if your Windows 10 PC has the DirectX app, then you can start the method to check computer specs Windows 10. Go to the Command Prompt (in Admin Mode). Now, type dxdiag and hit enter. Now, you will see that DirectX app has been opened. Click on Save All information to save all the specs of your Windows 10 PC. You can get to know that how to find computer specs Windows 10 using the speccy application which is developed by CCleaner. It is free to download and is very less in size. It is of 6MB only which is not a big deal to check a computer specs of Windows 10 or any Windows PC/Laptop. Follow the below method to check the specs of your Windows 10 PC and its extra details. Get the Speccy app from its official website. Install and then open the application on your Windows 10 PC. Now, you will see all the specs of your Windows 10 PC. You can get the more details from the left pane if you want to. In this method, you will be introduced to a web technology which is used to determine the specs of the computer. This is a website which will give you a web app, and after that, it will tell you all the details of your computer. Sounds interesting right? Let’s head up to the below method and check how it is possible. Go to the My Computer Details named website using Google search. Now, it will tell you to download a web app. Simply, download it and without installing simply run it. Now, wait for at least 10 seconds. Then, you will be able to see the computer specs on the website. In this way, you can get to know that how to find computer specs Windows 10. It is not a tuff task to check that what are the specs of a Windows 10 PC/Laptop. Also, the method is applicable for all Windows operating system PC doesn’t matter on the Windows version. I hope using this article you have now learned that how to find computer specs Windows 10. Share this article with your friends or relatives who are using Windows 10 PC. So, they can also get to know that how to find computer specs Windows 10.